Real Madrid retain interest in Eden Hazard? 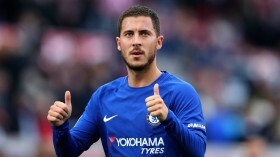 Real Madrid have reportedly made a fresh enquiry for Chelsea winger Eden Hazard after cooling their pursuit of Tottenham Hotspur's Christian Eriksen. Hazard has enjoyed an impressive Premier League season with the Blues this term and he is currently their leading performer with 10 goals and 10 assists to date. According to Spanish outlet AS, the European champions are planning to pursue a new left-sided winger during the summer and Hazard has been earmarked as the new option to fulfil the void. The Madrid giants were initially keen on pursuing Danish attacker Christian Eriksen for the summer but they are said to have been put off by Spurs' staggering transfer demands. In comparison, Hazard could be available for a relatively cheaper sum when the season concludes, given he has yet to show any eagerness to extend his contract beyond the 2019/2020 season. Hazard recently bagged a crucial goal during Chelsea's League Cup semi-final triumph over Tottenham Hotspur but he may not make the lineup on Sunday, where the Blues are scheduled to host Sheffield Wednesday in the FA Cup fourth round.